Unless you’ve been hiding under a rock you have heard of Craigslist. Craigslist is a great resource for selling things, finding apartments and jobs, locating services and meeting people. Most of the time transactions go smoothly and both seller and buyer are satisfied with the Craigslist experience. But lately more and more people are being scammed on Craigslist losing money and, in worst case scenarios, putting themselves in danger. To help keep yourself safe from scams, Craigslist advises that any business dealings be done with people in your own local area. Don’t do business with folks who live far away. Also look for listings with poor grammar and misspelled words. Beware of anyone offering more than what you asked for. Why would someone do that? Especially since Craigslist is known as the place to go for good deals. Below are some of the most common Craigslist scams and how can you avoid them. If you receive an email with very specific criteria…it’s more than likely a scam. Most will offer more than your selling price if you accept their check or money order. And if the buyer or seller tries to pay you with a money order or wire transfer — take that as a big, waving red flag. Scammers over the years have developed pretty sophisticated-looking fake packing slips or even money orders claiming to be from trusted institutions like Western Union. Often, these scams are part of a Nigerian 419 scam, and could entice you to send the buyer your goods before the fake check or money order clears. To avoid getting duped, don’t accept money orders on Craigslist and, if you must use a check, make sure it clears before sending what was bought. Ticket scams are among the more common scams on Craigslist. My husband was actually a victim of this. Savvy scammers have been able to make fake tickets that look real to big events like concerts or sports games. According to WiseBread.com, some scammers have even replicated holograms and watermarks on tickets for concerts or events — and these tickets are either fake or already cancelled – setting you up for a big disappointment. To avoid the headache, only go through reputable sites like Ticketmaster or the actual venue. In general, whenever an ad is not local, it’s generally not a good idea to pursue it. If someone posts a non-local ad they usually won’t be able to meet up with you and will often require transferring money through some online platform (which is a red flag!). Yes, you can accidentally land on a fake Craigslist site. Scammers often use similar domain names in hopes of snagging internet searches from the real Craigslist site and convincing users to trust the fake ones. Some of these sites look very realistic and could cost you a lot of money. Rule of thumb: if any Craigslist site does not have the address http://www.craigslist.org, it’s fake. Some scammers may use PayPal (or the promise of PayPal) to send or receive money on Craigslist. PayPal actually warns people to be wary of ads that want to use the site for transactions because many of them may never follow through or send you a fake PayPal email confirmation of a payment. Warning signs include emails that don’t address you by your full name or a statement that money is being held until you perform some action (like sending money through another wire service or using links to tracking orders). This is a really nasty scam, and we could all fall for it quite easily. It’s also known as “robbery by appointment.” As a Craigslist seller, you will know that cash reigns supreme. You don’t want to deal with bounced checks. 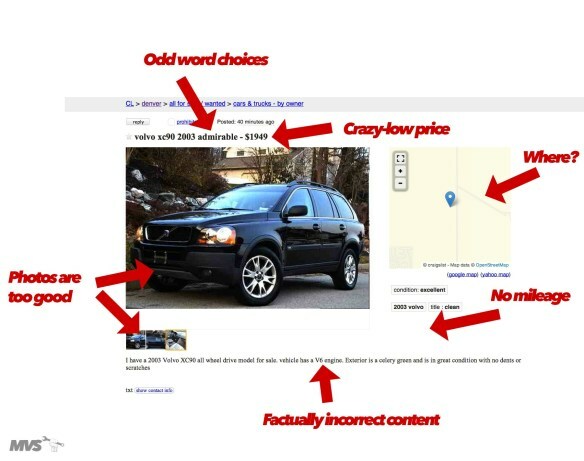 Craigslist scammers will place an ad for something like a car, high-end electronics, or another product of significant value. So you arrange to meet the seller (with a large amount of cash), and that’s when you’ll be jumped and the money taken from you. This “lure” scenario has happened many times over the years, which is why Craigslist advises you to meet in a safe, secure location, go with a friend (or two), and if in doubt, back out. This entry was posted in Investigations, Law Enforcement and tagged Craigs List, Email fraud, PayPal, Scams. Bookmark the permalink. ← Think Your Data Is Private Because You’re Not on Social Media? Think Again.